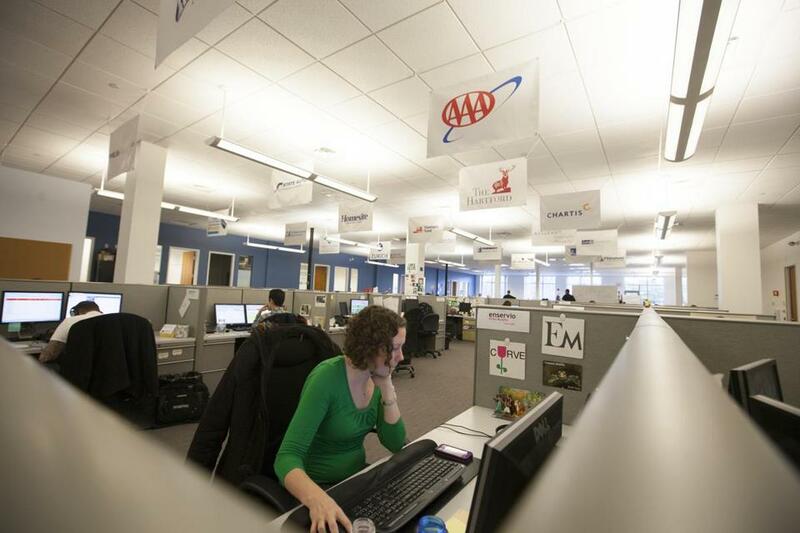 Erika Murphy works at Enservio, a Needham company that creates software for the insurance industry. Utter the word “enterprise,” and most people expect it to be preceded by the word “starship,” and piloted by Captain Kirk or Picard. But in Boston technology circles, enterprise is code for “we sell to deep-pocketed businesses, rather than flinty consumers.” While consumer-oriented companies like Facebook, RunKeeper, and Kayak may get all the media attention (mea culpa), enterprise entrepreneurs are busy building products that solve actual business problems and rack up major revenues. And after several years in which entrepreneurs and investors were fixated on the promise of social networks, mobile apps, and video games, they’re suddenly thinking about opportunities in the office park again. It turns out consumers can be extremely fickle, burning out on Zynga games like Vampire Wars or Groupon’s rock-bottom discounts. Enterprise tech is a strong suit for Boston — which long ago spawned pioneering hardware makers like Digital Equipment and software companies like Cullinet – and “we are entering a new golden era in the enterprise,” says Jo Tango, founder of Kepha Partners in Waltham. Tango notes that while it’s rare for West Coast venture capital firms to put money into Massachusetts companies, we’ve recently seen big-name firms like Sequoia Capital, Kleiner Perkins, and Andreessen Horowitz back local enterprise software start-ups. Recent highlights from Boston’s enterprise technology sector. And just last week, a new venture capital firm launched to make investments exclusively in new enterprise software companies. “Our slogan is that we don’t hate Internet companies,” says Amplify Partners founder Sunil Dhaliwal, “We just don’t invest in them.” While “it may not be the sexiest thing in the world to talk about taking on” companies like EMC, IBM, and Microsoft, he says, “There’s real value being created there.” Cambridge-based Amplify has so far raised $16 million of what it hopes will be a $40 million investment fund. Data from Dow Jones VentureSource, which tracks investments in private companies, show that the amount of money invested in Massachusetts enterprise start-ups grew by 27 percent from 2011 to 2012, while investment in consumer-focused start-ups here shrank by 16 percent. 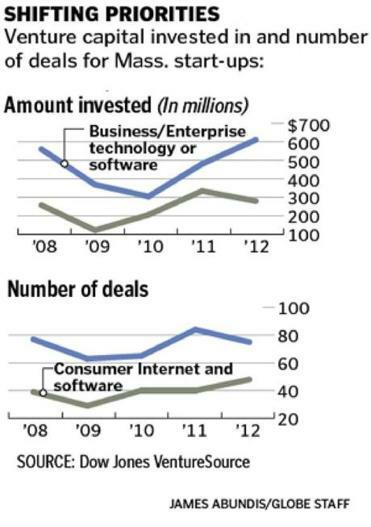 Enterprise-oriented start-ups are enjoying some strong tailwinds right now. Selling corporate software used to require a vast sales force, steak dinners, golf outings, and, if you were lucky, a big purchase order signed by the chief information officer. Then, there was a lengthy implementation as the new software was installed on company desktops or in the corporate data center. Now, employees anywhere in the company can sample Web-based software or mobile apps for free and pay only if they like them (and on a month-to-month basis, without lengthy contracts). “There’s much more freedom today for people across the company to make their own decisions about what software they’re going to use,” says Jon McNeill, chief executive of Enservio in Needham. McNeill’s company collects data about the items we have in our homes and their value, and sells that to insurers and retailers. Just six years old, it already has 450 employees and about $60 million in annual revenue. Skok observes that as more employees bring their own technology to work — like an Android smartphone or an iPad — companies need to make sure that those devices can access corporate data and applications, and also that they don’t create new security risks. And companies are collecting more data about customers and transactions with each passing day, which creates opportunities for tech companies to help them store it less expensively and extract useful intelligence from it. InsightSquared, a Cambridge company that sells Web-based analytics software to small companies, doubled in size last year, its founders say, to 40 employees and more than 200 customers. Chief executive Fred Shilmover says that most of its customers use Microsoft Excel to try to do things like forecast sales; his company’s software starts at $5,000 a year, and makes that job much simpler. Because bad guys never stop developing new techniques to steal corporate data, there are always opportunities for information security start-ups like Rapid7, Bit9, and Veracode. That last company, based in Burlington, offers a cloud-based system that helps customers test the security vulnerabilities of software they write themselves. It has raised $74 million from investors, and now employs 225 people. Watching some stodgy Massachusetts venture capital firms put dribs and drabs of money into mobile and social start-ups over the last five years has been a bit like watching a skilled ballroom dancer trying to pull off a convincing “Gangnam Style” gallop. But now that enterprise tech is back in vogue, they’re happy to be waltzing across the parquet again.